I don’t know about you, but in a world of increasing technology, being busy with a young family and living some distance from a lot of friends and family, I quite often find myself saying/writing/texting “I’m sending you a big hug”. It’s not as good as just being able to pop round and give them a hug but goes some way towards letting them know that if I lived round the corner I would be round in a shot doing just that kind of thing. Recently, my mum’s not been feeling very well and it’s not very easy for me to just pop in. However, Friday last week something was arranged very last minute for me to make a solo trip on Sunday. I wanted to take something with me and decided that a decent sized lap quilt that could be wrapped around you (just like a hug) would be perfect. I still had some fabric left over from my Jelly Roll quilt so I could start immediately and it was even a little stash busting to boot. Excellent! So Friday afternoon, around 3pm I started chain piecing all my squares together. By bedtime I’d managed to get all 56 squares sewn together in a 8×7 formation. Saturday I woke up early and decided that the quilt top just wouldn’t be quite big enough. A cream sash added around the edge bordered by a strip of squares using some of the jelly roll strips that I had left made it just right. I used the same cream fabric from the sashing for the back of the quilt and spent quite a lot of time pinning my three layers into place to try and avoid any puckering, and do you know what? It pretty much worked, although trying to keep a hold of my pins once Littlest Boy learnt what I was doing was a different matter entirely….!!!!! 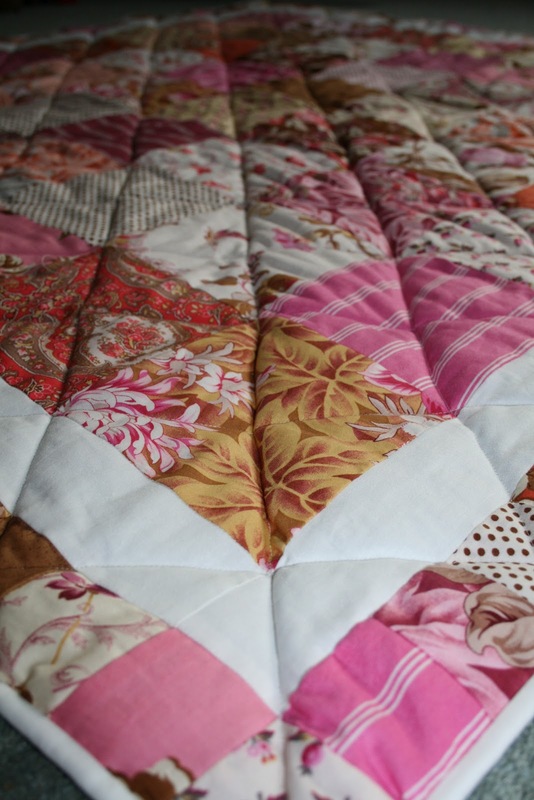 I kept the quilting very simple – diagonal lines crossing through the corners of each square. Sunday morning saw me rising early to sew on the binding before hand sewing it in place. I took the quilt with me to my folks house but had to bring it home to finish it off and post it down a few days later. Would you like to see how it looked in the end? It’s not perfect – I eyeballed my quilting and some of the lines are not completely straight. And because it was done quickly, I hadn’t entirely thought about the border so not all of the small squares match up to the big squares, but I guess it’s reflective of me as a person and maybe that will make my Mum smile as I’m giving her a virtual hug? Lots of enthusiasm but not entirely thought through!!!! I love how despite using completely the same fabrics as for my jelly roll quilt it has such a different feel because of the larger blocks of fabric and lighter sash/binding. I thought you’d all be amused to see what happens when you’re trying to take some pictures of a quilt and the Littlies suddenly realise what you’re up to.…. …and my favourite shot: two Little Boys giggling their heads off whilst I’m snapping away! And because I know that they sometimes read this I’m also sending a lot of heartfelt thanks to Mr f&f and his parents who occupied the Littlies whilst I was on my quilting mission, and stopped my pins, scissors and carefully laid out fabric from going too awry! Do you ever send a hug to someone? Or maybe even get sent one? Today’s sky ● glorious blue! Zippy Pouch Along – finishing up! Wow, I am so amazed by your talent! I would love to be able to quilt, let alone so beautifully and with that speed! Quilt maker, pattern designer and occasional dressmaker. I just love sewing and creating!